SYRIA is our energetic Morgan. She is curious and loves to move out, but is very sensitive to the rider. She has stolen the hearts of many here at Laughing Buck Farm. We are smitten with Jorgen. His huge, soft heart embraces everyone and he's always up for a hug. Jorgen is a haflinger, chestnut with flaxen main and tail. Horses don't get more kind than Chester. He is head of the herd -- strong and sweet -- and loves kids! Chester is a dunn quarter horse. LADYBUG has a mellow, easygoing personality. 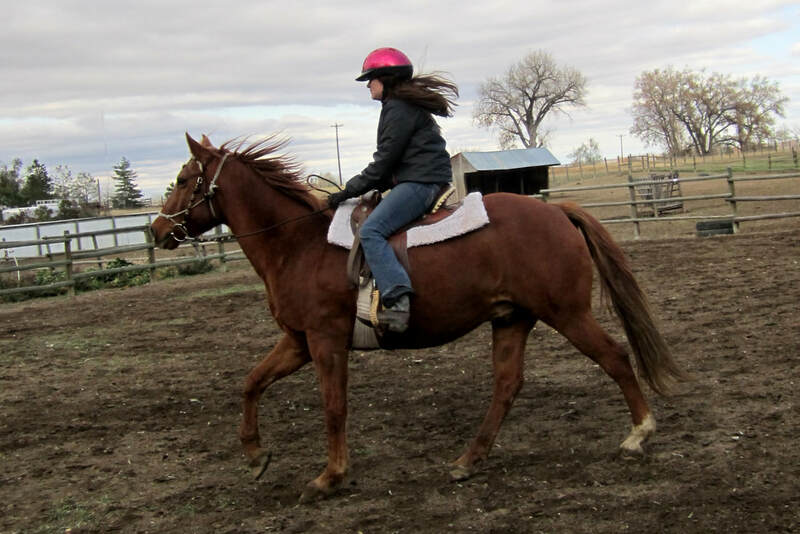 So many of our riders enjoy lessons on her. She is a quarter horse. GINGER is our shy, sweet pony. Kids get to practice being quiet and patient with her and love her gentle nature. Ginger is grade and we guess her to be a shetland pony. Alfie takes care of riders from walk, trot, to canter. Such a sweet boy! Alfie is a buckskin quarter horse. MAGIC is Rosemary's horse. She's a palomino with a nose as soft as velvet. CLIFFORD the big red horse was our gentle giant. With a heart of gold, he was gentle with beginning riders but loved to stretch his legs when he got a chance. CALVIN was our superstar lessons horse. Gifted from our barn manager, Kat, he had lots of energy and is super sweet. He loves his job at Laughing Buck Farm and enjoys hanging with his horse buddies at the farm. SASSAFRASS (SASSY!) was our superstar pony for about 10 years. She started as a pony for our boys and every farm kid fell in love with her. Calm and unflappable, she loved children and would stand patiently while being groomed. She took such good care of our beginning riders.